IBM is working on an initiative to provide a framework that dynamically integrates and synchronizes people, processes and assets associated with software development projects. Jazz is an initiative to transform software delivery making it more collaborative, productive and transparent. Jazz separates the implementation of tools from the definition of and access to the data. Jazz federates data across independent databases using Internet protocols. Jazz assumes an open, flexible, distributed data model. Jazz allows tools to be implemented in any Internet-aware programming language or platform. Jazz supports multiple client technologies. The Jazz Integration Architecture (JIA) is based on the industry initiatice called Open Services for Lifecycle Collaboration (OSLC). 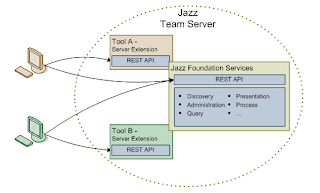 At the center of the Jazz Integration Architecture is the Jazz Team Server (JTS). The JTS implements the Jazz Foundation Services described by the JIA, which enable groups of tools to work together. These services include user and project administration, security, collaboration, query, and other generic cross-tool capabilities. When installed, tools are associated and work in conjunction with a particular JTS. Jazz is being developed as an open intiative. More details on how to download and start using the jazz platform can be found here.